2016 Porsche Panamera: a new generation of serial hatchback. German premium brand Porsche intends to start serial production of hatchback Panamera second generation until the end of next year. The basis for the development of new products was the MSB chassis, allowing to produce cars both in front and all-wheel drive. Assembling the model will be launched at the facilities of the Group plant in Leipzig, will take place immediately and the official presentation of the new Porsche Panamera in 2016. According to high-ranking representatives of Porsche, the car will retain the features and brand recognition, which, however, will not prevent engineers and designers to make a mark in it a number of significant changes. In addition, the modernization undergone Bumper group and the front fenders are now on the air vents. Transformation of «stern» has led to the fact that the model has become more like a fastback, but good or bad — everyone decides for himself. Innovations are not spared and the interior of the Porsche Panamera. In particular, we are talking about a new instrument panel and an upgraded center console with an integrated touchscreen infotainment center, which for convenience some controls on-board systems were transferred. In the salon, which offers an excellent overview of the road, the new seat mounted with multiple finishing options. It is expected that the new Porsche «lose weight» up to 1 thousand 800 kilograms. An important characteristic of the car — body, which has become stronger and more resistant to various types of damage. Through the use of MSB platform on which is built the new Porsche Panamera 2016, in the power range of hatchback will enter not only the conventional petrol and diesel engines, but the plug-in hybrid unit. It is likely that over time, the sale will be fully electric version of the «Panamera». The motor model range accurately enters the twin-turbocharged petrol «eight» V-shaped type, as well as the 3.0-liter V6 and benzomotor latest V6 diesel engine that develops 300 horsepower and featuring a modest fuel consumption. Transmission line form of the classic manual gearbox and semidiapazonnogo «robot» PDK. The drive system on all four wheels will be offered as an option. 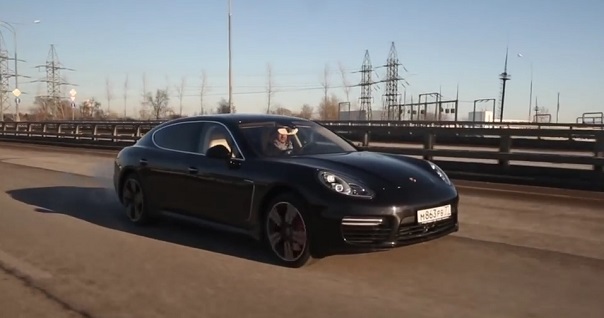 Test drive the 2016 Porsche Panamera.